GST software by LegalRaasta is a turnkey software solution for GST registration, accounting and billing. The software comes with unique features, such as multi user & unlimited companies, reconciliation, excel/ERP import, and unlimited returns. The GST software is designed in a manner that users with limited IT skills can also use the software. 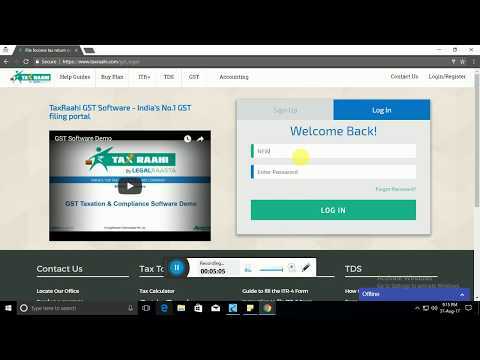 The software automates filing of GST return with five easy steps. Other noteworthy features of this GST software for Chartered Accountants, small businesses and big enterprises are multi-currency, HSN finder, invoice generations, ledgers, tax payment, place for supply finder, seller mismatch notification, etc. Q. Why should I buy software and not use Government website? Government website displays countless fields and contains limited description. One has to keep looking for instructions to understand about each column. In comparison, LegalRaasta GST Software is extremely intuitive and easy to understand. Reconciliation: The government software doesn’t allow you to automatically reconcile supplier data with your purchases. You will have to manually reconcile each purchase invoice one by one which is literally impossible if you have 100+ invoices every month. Our GST software does automatic reconciliation almost instantly and notifies mismatches thus saving a lot of your time. Simplifying taxes for you: We have broken down the complex process of GST return into a series of tabs and windows. Our software also provides tool tips and videos making it a simplified and time saving solution for GST filing. User Friendly: It has an excel-like interface with step by step process which helps you to navigate back and forth easily unlike the tangled and confusing government system. Data Import:You can directly import from excel or your ERP solution (Tally, SAP, Busy etc). This is not possible via the government utility. Handle multiple GSTINs:Moreover, for Chartered Accountants and other Professionals, login has to be done on government portal every time for each client separately. LegalRaasta GST software creates a session for a longer period to file return of multiple clients without having to log in multiple times. Q. From which software/ERP I can import into your system? Q. How does Reconciliation works in LegalRaasta GST software? Reconciliation works as follows: Our GST software automatically fetches the data from the government (supplier’s data). In parallel, you can import your complete data from your choice of ERP. The system will reconcile the government data with your data and will suggest the mismatches. You can easily edit/approve the mismatches and file the return. Q. What is included in the software pricing?